In June 2015, forty women from eighteen countries from every continent attended an energetic and inspiring residential week at the Bognor Regis Campus of the University of Chichester. The aim of the week was to increase the confidence and competence of women leaders working in sport and add to an emerging global network of women sport leaders. Despite the declarations, changes in policy, and the introduction of quotas and targets over the last thirty years, women continue to be under-represented and marginalised from senior decision-making and leadership positions in sport. This appears to be due to stereotypical assumptions regarding what women can and cannot do, a perceived lack of experience and mentoring of leadership competencies during their careers, and poor organisational structures which work to limit their progression. WSLA aims to change this. Building upon the success of WSLA 2014, the Anita White Foundation (AWF) partnered with Females Achieving Brilliance (FAB), supported by the University of Chichester, to enable the participants to challenge themselves, learn from others, and further advance their own personal development and goals during WSLA 2015. The participants occupy middle-to-senior management or Board positions across a range of national and international sport federations, Ministries and National Councils of Sport, universities, and sport for development and physical activity organisations. All had been identified as future leaders at senior management level by their organisations who had also committed to support their WSLA 2015 participant after the week had finished. The WSLA steering group were delighted to be able to offer scholarships and travel grants that allowed participants from Bangladesh, Botswana, Kenya, Laos, Malawi, St Lucia, South Africa, and Uganda to attend. The diversity of experiences from many cultures in relation to women sports leadership generated a broad scope of discussions during the week. A non-threatening, inclusive, positive learning environment was established early on and continued during the five days that that dealt with different themes around leadership: self-development, communication, growth mindset, leading by example, and planning and prioritising. Each theme was explored using a variety of sessions such as workshops, peer mentoring, physical challenges, and networking support groups. These sessions encouraged the participants to be flexible in approaches to challenges, be willing to change their mindset and embrace different ways of dealing with conflict. The small group work provided an opportunity for the women to share ideas and help each other tackle real problems they are facing in their work situations. The sessions were delivered by a range of facilitators. Pauline and Lucy (co-founders of FAB), led the programme content and were assisted by their colleagues Barbara Daniels and Selena Creighton. From the AWF, Dr Elizabeth Pike, Dr Jordan Matthews, and Dr Anita White OBE contributed their individual expertise on social movements, social change and activism, sport for development, management, and working with boards. Further support was provided by Linda Low (WSLA 2014 graduate; Rugby Football League), Lombe Mwambwa (General Secretary for the National Organisation for Women in Sport, Physical Activity and Recreation in Zambia – NOWSPAR), and Jacqui Stone (SportScotland) to provide a plethora of expertise to benefit the participants. Throughout the week the participants worked in one of seven Home Teams supported by a facilitator. The teams met regularly to reflect on learning, raise topics and concerns, discuss issues affecting them in their work, and provide support and encouragement. The latter was in respect of a variety of scenarios where the participants had challenged themselves and succeeded in different ways, such as new presentation styles or learning to deal with conflict. The Home Teams also competed with each other on various tasks. A Celebration Reception was hosted on the final evening to recognise the personal development achievements of the participants. Fifty guests were in attendance and GreyMatter provided the evening’s entertainment. The guest speaker for the evening was Kereyn Smith MNZM, CEO of the New Zealand Olympic Committee. Kereyn reflected on the challenges and opportunities she has encountered during her journey as a women’s sports leader. She also recollected some experiences she had shared with Anita during the development of some of the women and sport movement over the last two decades. 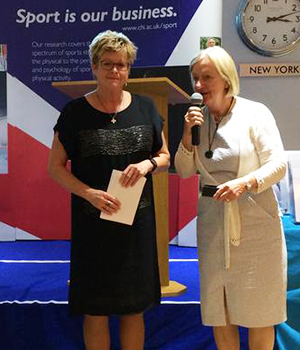 She concluded her speech by praising WSLA as “the greatest women’s sport leadership programme on the planet”. The cohort established many friendships and since the residential week for WSLA 2015 was completed, the WSLA team has reflected on the heartfelt thanks from some of the participants who have claimed the whole experience to be life-changing. The WSLA team will continue to communicate with the WSLA 2015 graduates during the next twelve months. Each participant completed a Personal Development Plan during the week and we will be in six-monthly contact to determine how they are progressing towards their goals. On the final morning of WSLA 2015, the participants determined their own legacy and by combining these ideas with the 2014 graduates. This generation of a network of international women sports leaders is an exciting and promising catalyst for change. The AWF and FAB would like to thank the University of Chichester for its tremendous support, as well as a range of organisations and individuals that donated money or sponsored the attendance of the participants.